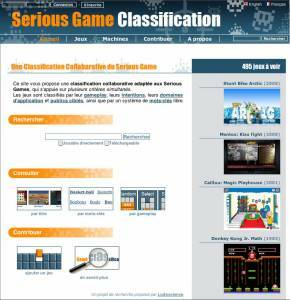 Spinoff created from Game Classification, this website aims to gather and classify as many Serious Games as possible. Therefore, it relies on a classification model designed for Serious Games, the G/P/S model (Gameplay / Purpose / Scope). Minhua Ma, Andrea Oikonomou, Lakhmi C. Jain (eds. ), « Serious Games and Edutainment Applications », Springer, pp.25-43, 2011. "Le Serious Game, levier du développement économique territorial ?" "Serious Games market: Some key figures (from 1950's to 2000's)"
LudoScience en partenariat avec l'IDATE, 2011. "Serious Games: an online collaborative database"
1st Gala Alignment School, Heriot-Watt University, Edimburg, Scotland, 2011. 4e Serious Game Sessions Europe, Lyon, 2008.